Patrick Kpozo (born 15 July 1997) is a Ghanaian professional footballer currently playing for AIK Stockholm in Sweden as a defender. Setting some of his brightest and youngest talents out to stardom, Kpozo is a delight to watch, his speed and work rate makes him an ultimate choice to have in your team. Patrick Kpozo grew from Inter Allies youth ranks, Accra Youth to the main team after developing rapidly with the help of the technical handlers. He was promoted to Inter Allies Kpozo in 2014 and as teenager surprised most of the football enthusiast and pundits in Ghana, including his colleagues. His outstanding performance that season won him the Most Promising Player (Discovery Player) accolade in the MTN FA Cup. Kpozo made his professional debut for AIK in a Svenska Cupen match against Ekerö IK in 2015. He has then featured for AIK on several occassions where he has mastered his trade as a perfect left back for the team. 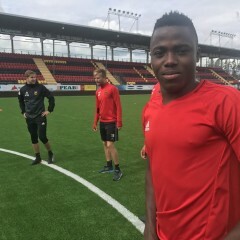 On 28 March 2017, Kpozo joined Tromsø on loan until the summer. He left AIK in July, 2017 to another Swedish side Östersunds FK. In 2015, Kpozo was handed a call up to the Ghana U20 team and made the final cut to the FIFA U20 World Cup in New Zealand. He played one game in the tournament, where Ghana played three games and were eliminated in the Group Stages.